President: 1886, 1887, 1888, 1889, 1890, 1891, 1892, 1893, 1894. 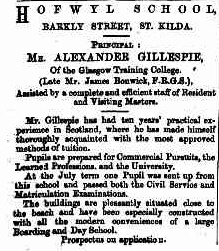 Alexander C. Gillespie held a first-class teaching certificate from Scotland, and he and his wife with their young family decided to emigrate to Victoria. Gillespie met the head master of Hofwyl School, a Mr. Bonwick, while enroute to Melbourne. The head master offered him a teaching position and they arrived in Victoria in 1871. After 9 months Alexander purchased the goodwill and furniture and ran the school with himself as head master. When the lease expired, he founded a new school nearby and he became the founder and first head master of the St. Kilda Scotch College. Alexander bought the building from the original owner in 1878. The school was located at 172 Barkly Street, near the Village Belle, and was demolished in December 1936. The building had stood for more than 80 years. He was one of the many victims of the Land Boom Crash when the value of land plummeted in Victoria in the 1890's, this led to a major economic depression. In june 1893 Alexander filed his schedule in the Insolvency Court. Gillespie retired from teaching in 1900. Alexander Gillespie died Nov. 1924 at his St. Kilda residence of 54 years 168 Barkly Street St. Kilda, he had recently turned 83. It appears St. Kilda Scotch College was a separate insititution from Scotch College Melbourne. Little is known of his association with Carlton despite being the Club President for 9 years. "The retiring president, Mr. Alexander Gillespie, was re-elected without opposition. In returning thanks Mr. Gillespie said he hoped there would be less rough play in the coming season than in 1889, when it was so bad as to call for a special remark from the secretary of the association. He was no advocate of gentility on the football field, and no harm was done provided players only used their strength legitimately. He divided rough play into three classes, kicking, slinging, and striking. The first was brutal, the second cowardly, and he could not find words strong enough to express the abhorrence of the last. He urged the new twenties that they should play the game in a manly straightforward manner, and keep good the name of the club for fair play. (Cheers)"
Page last modified on Monday 30 of July, 2018 10:05:32 AEST by blueycarlton. 1978 - Victorian Team Profiles.